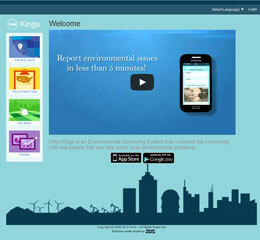 The IVAN Kings project is a model that demonstrates the power of collaboration and innovation through the establishment of community-driven environmental enforcement entities that are efficient, effective, and transparent in protecting human health and the environment from toxic harm. This concept evolved from a series government-sponsored bus tours that occurred throughout the country over the past ten years. These events brought together state, local, and federal environmental regulators to attend daylong bus tours and workshops conducted by community residents and advocates. Using this model, the Imperial Valley IVAN team, led by CCV, implemented a similar series of “Toxic Tour” bus tours in the Imperial Valley. 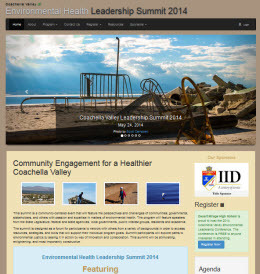 The 2014 Coachella Environmental Health Leadership Summit is a community-centered event that will feature the perspectives and challenges of communities, governments, stakeholders, and others with passion and expertise in matters of environmental health. The program will feature speakers from the State Legislature, federal and state agencies, local governments, public interest groups, residents and academia. The summit is designed as a forum for participants to network with others from a variety of backgrounds in order to access resources, strategies, and tools that will support their individual program goals. Summit participants will explore paths to environmental justice by seeing it in action by way of innovation and collaboration. This summit will be stimulating, enlightening, and most importantly constructive. The IVAN Online mobile app is a white label version of the Ushahidi mobile application; an open source platform for information collection, visualisation, and interactive mapping. This app empowers the community, government, non-profit, academia, and others to collaborate in the reporting and tracking of environmental concerns. It provides for community policing through the use of crowdsourcing technologies. 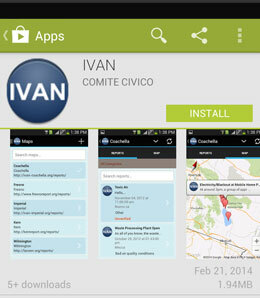 The app comes with IVAN deployments preloaded but can also synchronize with any other Ushahidi or Crowdmap deployment. Mobile technologies provide a remarkable opportunities for the use in environmental policing. In essence, smartphones are portable, internet-enabled computers with a variety of sensors. They provide us with a set of powerful research tools for collecting data such as global positioning systems (GPS), access to geographical information (GIS), microphones, accelerometers, and cameras. The CCV site was revamped using the bootstrap framework, a sleek, intuitive, and powerful mobile first front-end framework for faster and easier web development. 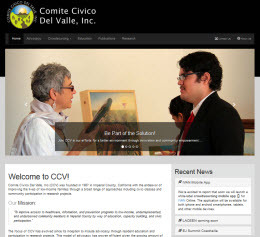 Comité Civico del Valle located in Imperial County, California was established by Jose Luis Velez, a retired farmworker in 1987 to help other farmworkers and the larger community. The organization was formally established in 1989 to serve the needs of the underserved Imperial County residents. 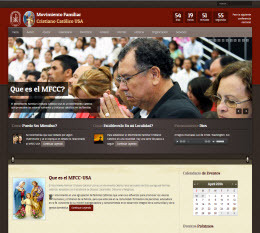 The MFCC USA site a a group of Catholic families that together join efforts to promote both human and Christian values within the family setting. Applying these values to the community and to people's lifestyles allows for families to form stronger, value centered persons. It also allows for these families to become educators of faith by strengthening consciousness of their evangelizing mission to families, the church, and the community as a whole. Internationally, the MFCC USA is part of the International Confederation of Christian Family Movements (CIMFC). Nationally, the MFCC USA is spiritually advised by a Bishop who represents the MFCC-USA before the Episcopal Conference of the United States. In the U.S., the MFCC-USA is registered and duly acknowledged before civil laws as a Non Profit Organization. 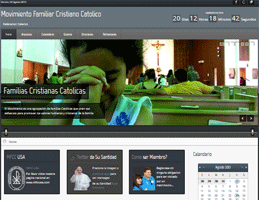 The MFCC site is part of a national movement of parish groups of families that meet to reinforce Christian Catholic values and encourage active fellowship between families. Families are placed in groups of five to seven families and meet twice per month in each other's houses. At the meetings parents discuss their opinions on certain topics and then commit to implement actions that positively affect families in the community. 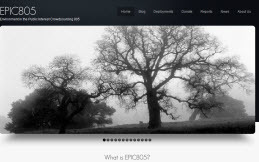 The Environment in the Public Interest Crowdsourcing 805 (EPIC805) is a public trust resource watch network seeking to locate, document, and inform appropriate agencies to resolve observed environmental violations in the San Luis Obispo County. The EPIC805 project fills a needed gap between citizens and government agencies to solve local problems that threaten our water, our land, our way of life on the Central Coast. Community Action And Strategies For Empowerment, Inc., (C.A.S.E.) is a California non-profit public benefit corporation duly organized and recognized by the California Secretary of State (C#3502721) (September 10, 2012). CASE is responsible for developing community policing programs that serve as cost-effective and powerful deterrents. Their programs couple the use of regional task forces with technology and community intelligence in spotting, targeting and fixing "broken windows" at a local level. This is home of the Marine Protected Areas Action Network (MPAan). The MPAan is part of a 3-year pilot project to develop and implement an effective statewide Marine Protected Areas (MPAs) enforcement program. The program will ultimately cover all of the 840 square miles of state MPAs that represent 16% of California‘s coastal waters. 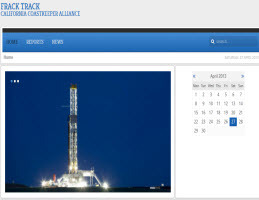 The FrackingTrack project is the California Coastkeeper Alliance's efforts to track and report fracking. Fracking is the propagation of fructures in a rock layer caused by the presence a pressurized fluid. It's a technique used to release petroleum, natural gas, or other substances for for extraction. 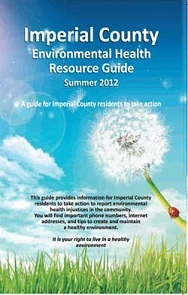 The Imperial County Environmental Health Resource Guide provides information for Imperial County residents to take action to report environmental health issues in the community. 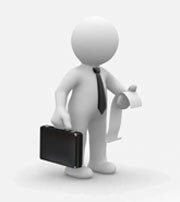 You will find important phone numbers, internet addresses, and tips to create and maintain a healthy environment. 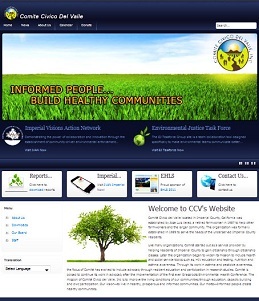 The Imperial Action Vision Network (IVAN) project is a model model that demonstrates the power of collaboration and innovation through the establishment of community-driven environmental enforcement entities that are efficient, effective, and transparent in protecting human health and the environment from toxic harm. 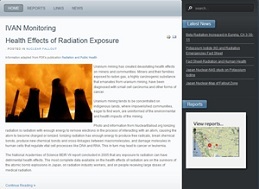 The IVAN Monitoring project is a network of community members monitoring for radiation in the Western United States. 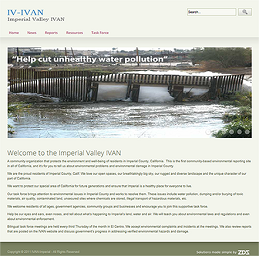 This community-based environmental reporting site is modeled after the IVANOnline tool in Imperial Valley. Comite Civico del Valle, Inc.(CCV) and the National Latino Research Center (NLRC) at California State University San Marcos, in collaboration with many community-based organizations, government agency representatives, elected officials, grant-makers, and Imperial County resident leaders, designed a summit meeting to convene and engage stakeholders (partnerships and collaboration) with the purpose of increasing awareness of the significance of environmental health disparities (research and education), and building capacity (leadership and civic engagement) to identify and promote community-based solutions to improve health and quality of life for all residents in Imperial County. 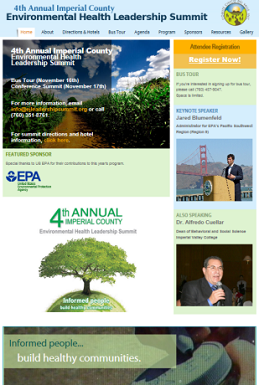 The inaugural Summit - held on June 2, 2007 - and subsequent summits - held February 28, 2009 and May 22, 2010 – brought together residents, educators, community leaders, health care providers, and environmental justice advocates to discuss important environmental health concerns in Imperial County. The purpose of each year’s summit is to raise awareness about environmental justice issues, present new data and research, identify key priorities and discuss evidence-based strategies to address key issues in Imperial County in the coming years. The 2011 summit will take place November 16-17, 2011. 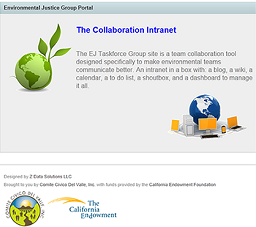 The Environmental Justice Taskforce Group site is a team collaboration tool designed specifically to make environmental teams communicate better. 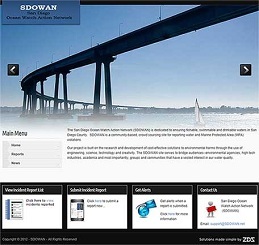 An intranet in a box with: a blox, a wiki, a calendar, a to do list, a shoutbox, and a dashboard to manage it all. 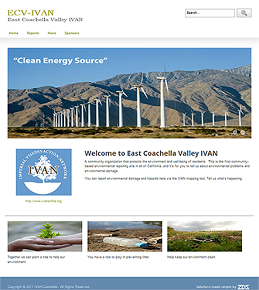 The East Coachella Valley IVAN is a community organization that protects the environment and well-being of residents in the East Coachella Valle. Imperial Valley IVAN is a community organization that protects the environment and well-being of residents in Imperial County, California. This is the first community-based environmental reporting site in all of California, and it's for you to tell us about environmental problems and environmental damage in Imperial County. We are the proud residents of Imperial County, Calif. We love our open spaces, our breathtakingly big sky, our rugged and diverse landscape and the unique character of our part of California. We want to protect our special area of California for future generations and ensure that Imperial is a healthy place for everyone to live. Our task force brings attention to environmental issues in Imperial County and works to resolve them. These issues include water pollution, dumping and/or burying of toxic materials, air quality, contaminated land, unsecured sites where chemicals are stored, illegal transport of hazardous materials, etc. 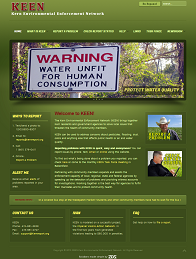 The Kern Environmental Enforcement Network (KEEN) aims to assist with the enforcement of environmental health laws in Kern County through a partnership between community members and agencies. Partnering with community members can greatly expand and assist the enforcement capacity of agencies by speeding up the identification of problems and providing witness accounts for investigations. 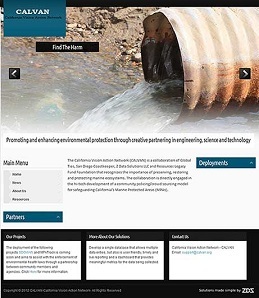 The project combines online reporting of problems with convening a multi-stakeholder task force to address reports. KEEN is modeled on a very successful project implemented in Imperial County called Imperial Visions Action Network or "IVAN". California Vision Action Network - CALVAN is promoting and enhancing environmental protection through creative partnering in engineering, science and technology. With collaboration of Global Ties, San Diego Coastkeeper, Z Data Solutions LLC and Resources Legacy Fund Foundation that recognizes the importance of preserving, restoring and protecting marine ecosystems. The collaboration is directly engaged in the hi-tech development of a community policing/crowd sourcing model for safeguarding California's Marine Protected Areas (MPAs). 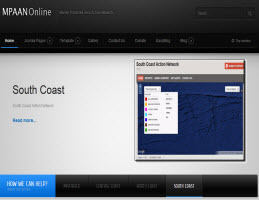 The San Diego Ocean Watch Action Network - SDOWAN project tracks the activity in the Marine Protected Areas (MPAs) in the San Diego coastal area. 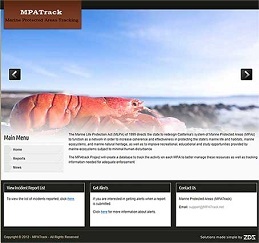 The MPATrack Project will create a database to track the activity on each MPA to better manage these resources as well as tracking information needed for adequate enforcement.